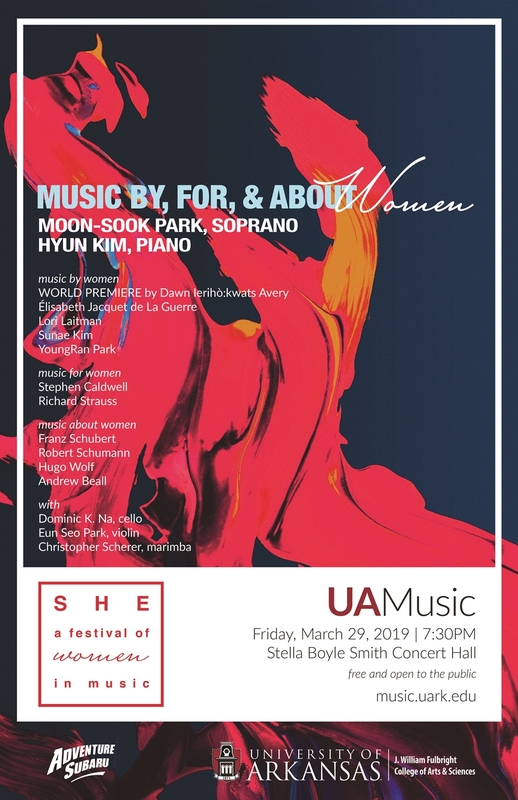 As part of the inaugrual SHE Festival of Women in Music, soprano Moon-Sook Park will present a concert called "Music By, For, & About Women" with Hyun Kim on piano. Park will also be joined by UAMusic faculty and guests Dominic K. Na (cello), Eun Seo Park (violin), and Christopher Scherer (marimba). The eclectic concert works to present women's voices in unique ways. The program will include music by Elisabeth Jacquet de La Guerre, Lori Laitman, Sunae Kim, YoungRan Park, Stephen Caldwell, Richard Strauss, Franz Schubert, Robert Schumann, Hugo Wolf, and Andrew Beall. The concert will feature of the world premiere of Mohawk composer Dawn Ierihò:kwats Avery's Ionhontsiá:te (Mother Earth). Park is an associate professor of music/voice at the J. William Fulbright College of Arts and Sciences, University of Arkansas. Park, a native of Korea, began her professional career in Europe with countless performances as a soloist to her credit. She has presented numerous solo and chamber music concerts—including Coronation Mass (Mozart), Requiem (Mozart), C-Minor Mass (Mozart), Vesperae Solennes de Confessore (Mozart), German Requiem(Brahms), Messiah (Handel), St. John Passion (Bach), St. Matthew Passion (Bach), Magnificat (Bach), B-minor Mass (Bach), Magnificat (Vivaldi), Nelson Mass (Haydn), Creation (Haydn), Stabat Mater (Haydn), Elijah (Mendelssohn), Paulus (Mendelssohn), Lobgesang (Mendelssohn), Requiem (Fauré), Gloria (Poulenc), Stabat Mater (Rossini), Requiem (Lloyd-Webber), Stabat Mater (Dubois) — and as well as operatic and avant-garde works in many countries including the United States, Germany, Italy, France, Switzerland, Austria, Slovakia, Mexico, Hungary, Czech Republic and Korea. She was a stipend recipient of K.A.A.D. in Germany (a scholarship for young future scholars) and won the coveted Bayreuth Stipend Award at the Bayreuth Festival in Germany for extraordinary young artists. She performed in notable world premieres at prominent music festivals such as the Darmstadt Neu-Musik-Festival, Hindemith-Festival, Webern Festival, Wagner Festival, and Mozart Festival, many of which were recorded for broadcasts on major radio stations in Germany (WDR, SWF, HR). She was also featured in the 1992 Rossini Festival, which included world-premiere performances of two recently uncovered Rossini works on the bicentennial of his death. These live performances were recorded and are available on CD and have been preserved as historical archive materials. Park holds a D.M.A. in Voice Performance and Vocal Pedagogy from the University of Cincinnati College-Conservatory of Music and graduate degrees from Freiburg (art song, opera), Saarbrücken (vocal music for the concert stage), and Stuttgart (Lieder performance) music conservatories in Germany, a private diploma (opera, bel-canto technique) from the Academia di Canto F. Cavalli of Milan, and a B.M. from Seoul National University. She has studied voice with prominent singers such as Eva Brink-Hillemann, Luisa Bosabalian, Siegmund Nimsgern, Philipp Huttenloch, Floriana Cavalli, and Barbara Honn, and has participated in master classes with Elizabeth Schwarzkopf, Dietrich Fischer-Dieskau, Ingrid Bjoner, and others. Dr. Park's former students sing professionally in Europe, Korea, and the United States and hold professorships in voice around the world. They have won numerous vocal competitions, such as Internationaler Wettbewerb für Liedkunst in Stuttgart (a prestigious German art song competition), the Concours Chimay Chant Baroque in Belgium, the International Singing Competition in Cologne, the Corbett Opera Scholarship Award competition in Cincinnati, and the Metropolitan Opera National Council Auditions. Since Park's U.S. debut solo recital at Carnegie Hall in 2001, she has found her second home in the U.S. and her reputation as a performer and scholar has been acknowledged nationally and internationally in lecture-recitals, solo concerts, chamber music, operatic works, avant-garde music, and master classes. She is also a member of Pi Kappa Lambda and the National Association of Teachers of Singing. Dr. Park was a member of the voice faculty at the Saarburg Music Festival in Germany for years and currently is a member of the artist-faculty at the Brancaleoni International Music Festival in Piobbico, Italy since summer 2017. In conjunction with Women's History Month, the Department of Music in the J. William Fulbright College of Arts and Sciences will host an inaugural, month-long festival from March 5-30 highlighting the major role that women have played in the art of music. SHE, A Festival of Women in Music will recognize women across the field with an array of music featuring women composers and performers. "Music often breaks down the barriers that separate us," said Ronda Mains, the Department of Music's chair. Mains said that in a time when society often strains to listen, "SHE makes room for audiences to hear new sounds, to feature composers of fame and lesser-known stature, and to amplify exceptional stories—all drawing attention to compositions by women, works inspired by women, and music for women." Mains said that SHE also crosses borders, intends to evoke an emotional response, and will prompt historical and cultural memories for all who attend. With guest lectures, performances of Western art music and contemporary music, and a one-woman play, the festival is filled with events that will spur thought and excite audiences. SHE is sponsored by Adventure Subaru of Fayetteville and presented in partnership with the J. William Fulbright College of Arts and Sciences Humanities Program, the Jim and Joyce Faulkner Performing Arts Center, and the Osher Lifelong Learning Institute at the University of Arkansas. More information about this event can be found on the Department of Music's website.